This photo essay is an invitation to explore Japanese Zen gardens, often referred to as karesensui, or dry landscape gardens. Karesensui literally means “dry mountain water.” Resorting to simplest materials – rocks, gravel and sand – designers of these "dry" gardens create three-dimensional landscapes, in which water is represented by its material opposite – sand; and rocks, which the Japanese revere as sacred objects, symbolize mountains and islands. Inspired by traditional ink wash or sumi-e paintings, in which meanings are expressed with most limited means and in which absence or empty space is as important as what is present, karesensui gardens are to be experienced as works of art. They might celebrate and connect people with Nature, but hardly anything in them is natural. Framed by walls, fences, verandas or shoji doors, these gardens present a condensed, distilled version of Cosmos. Rather than walk or touch anything, visitors are encouraged to interpret them — confront multiple contradictions, mysteries and riddles, which more often than not cannot be solved. But in Zen, it’s the process – the Way -- that is far more important than the end result. It is often assumed that karesensui gardens are created as spaces for Zen meditation. Wrongly so. 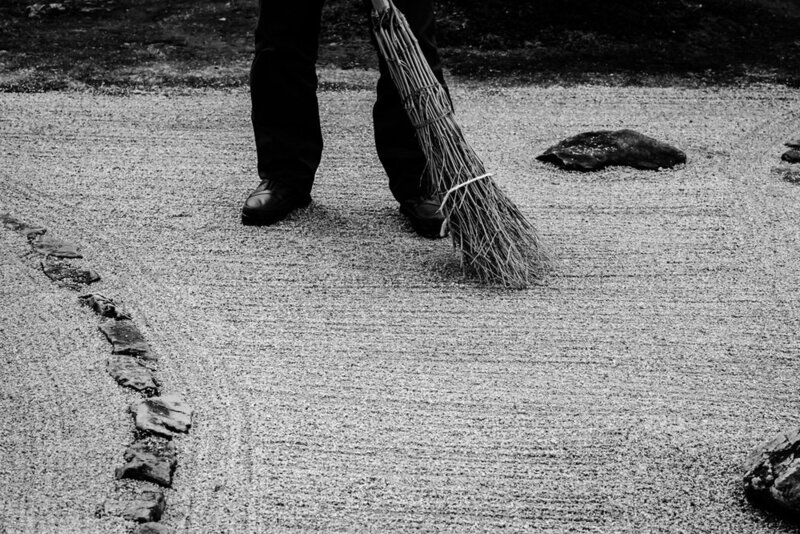 In fact, their importance for Zen spirituality is related to the patience and focused attention with which Zen monks meticulously rake, sweep, brush, clean, and weed them. 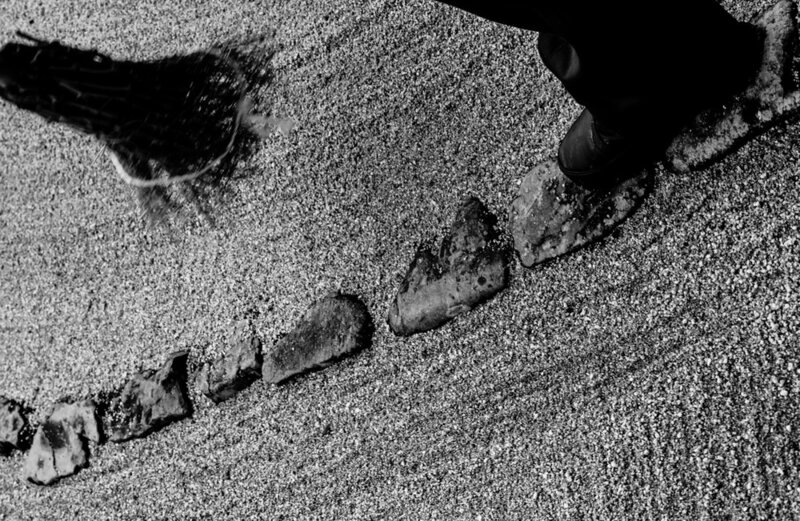 Sisyphean absurdity of such endeavors – tentativeness, ephemerality and instability commonly associated with moving sand – can be viewed as a metaphor of something trivial and futile. But this is exactly what Zen elevates and what forms the basis of its spiritual discipline. Paradoxically, it’s through mundane, repetitive tasks that man is able to challenge and tame powerful Nature. Every sweeping and re-raking of gravel and sand creates the garden anew even though it remains the same as before. Thus, against the passage of time -- despite the wind, rain, earthquakes, gravity and weeds – karesensui garden maintains its identity; it does not change, does not grow old, doesn’t disappear. The monochromatic, highly abstract compositions of karesensui gardens lend themselves well to black and white photography in which forms are condensed and abstracted to offer some interpretation rather than realistic depiction of reality. My images taken in multiple temples of Kyoto and Kamakura over the span of three years are not intended to represent any particular place or garden. Instead, they focus on the metaphoric nature of Zen gardens – the contradictions that we are invited to confront, riddles that we are not quite able to solve, repetitiveness of our experiences and fragmentary nature of our perceptions.